The Bielinski family, from left, Peter, Kathryn, Laura and Will, on graduation day, May 12, 2012. Photo by Rebecca Sharp Sanchez. Saturday May 12, 2012, was a big day for the Bielinski family. 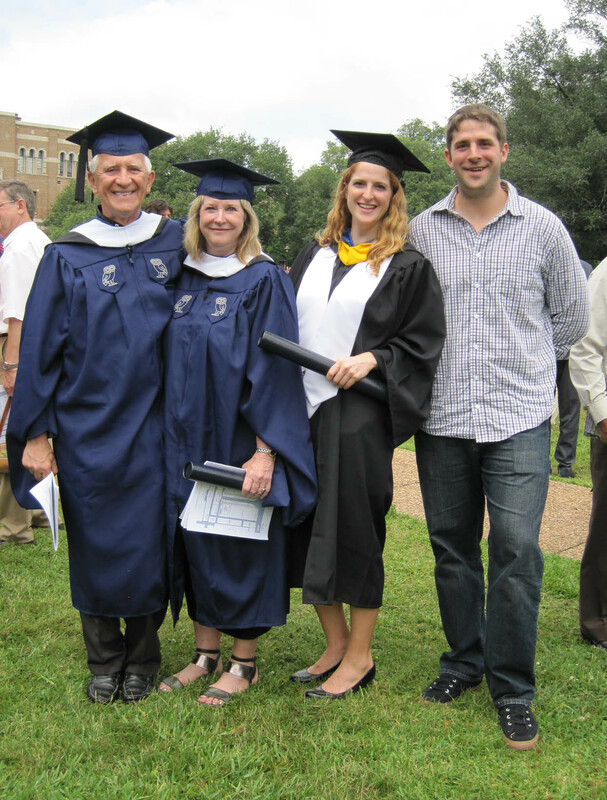 Kathryn and Peter Bielinski both graduated from Rice with a Master of Liberal Studies degree, and their daughter Laura received her bachelor’s degree, having double majored in physics and history. Son Will had it pretty easy — he just had to watch the ceremony — but he had already earned a Rice bachelor’s degree in economics in 2009. Peter and Kathryn began the Master of Liberal Studies (MLS) program when it began in the fall of 2005, making them members of the “Founding Scholars” group that set the standard of excellence for the program. As associate general counsel for a local manufacturer and a sales representative and trainer with a textile company, respectively, Peter and Kathryn lead busy lives but know the value of continuing education. With two teenagers about to start college, what made you want to start college again yourselves in 2005? The opportunity just happened to present itself at that time. We had attended Continuing Studies courses at Rice in the past, and were on their email list and received notice of the MLS program. Will started his freshman year the same time we started at Rice, so the MLS program did help fill the void that occurred when he left. Why did your kids choose to attend Rice? Kathryn’s father, who went back to college for a master’s degree at the age of 73, had wanted to pursue a doctorate at Rice. The value that he placed on lifelong learning had an impact on all of us, as did his high regard for Rice. In addition, the school just “fit” both academically and socially for both our kids. Laura actually started at Washington University in St. Louis, but wasn’t that happy, and at the advice of her brother, transferred to Rice after her freshman year. She couldn’t be happier with that decision. What’s been the most unexpected joy of the whole family attending Rice together? There have been many things, but one of my favorites is that everyone in the family took classes from Dennis Huston (actually, some of us took every class he offered). And hanging out together at Valhalla, where Peter volunteers as a bartender. What has the MLS program done for you as individuals? As a couple? It broadened our interests, both individually and as a couple. It was an experience that we enjoyed sharing, and we met many wonderful friends that mean so much to us and whom we see regularly. With everyone having graduated, you won’t be paying tuition anymore. Any big plans for the “raise” you’re about to get? We will continue our involvement at Rice by auditing MLS classes and taking courses offered by the Glasscock School. We also enjoy traveling, so we might step that up a bit. The staff of the Glasscock School of Continuing Studies congratulates the Bielinski family on this momentous achievement. Other photos of 2012 commencement for our MLS students can be found on the MLS Facebook page.